The Pentagon doesn’t know how well its advisors are advising in part because it keeps moving the goalposts. Over the last 17 years years there has been much change in the war in Afghanistan: the mission shifted from counterterrorism to counterinsurgency; the focus moving from combat to advising; the U.S. president changed from George W. Bush to Barack Obama to Donald Trump. Numerous commanders have managed the war and spoken of corners turned in the fight against a shifting cast of enemies, from al-Qaeda and the Taliban to the Islamic State’s local offshoot. “Winning” has always been the goal but the goalposts themselves remain ill-defined and shifting, too. A recently released audit report from the ever-disappointed Special Inspector General for Afghanistan Reconstruction (SIGAR) underscores this trend in context of the the U.S. Department of Defense’s train, advise, and assist mission in Afghanistan. The audit covered Pentagon-funded advising efforts in the Afghan Ministry of Defense (MOD) and Ministry of the Interior (MOI) from January 2015 to April 2018. Creating “well trained, equipped, and sustainable Afghan National Defense and Security Forces (ANDSF) that are capable of securing the country” has long been a U.S. goal in Afghanistan. To further this mission, the advisers — uniformed military, Afghanistan Hands, civilians in the Ministry of Defense Advisors program, Defense department “Expeditionary Civilians,” or contractors — assist counterparts in the Afghan Defense and Interior ministries in a range of areas like procurement, logistics, and resource management. According to SIGAR, since 2010 the U.S. Department of Defense has awarded four contracts, worth $1.62 billion, to DynCorp International to provide contracted advisers to the Afghan Defense and Interior Ministries. The two ongoing contracts, worth more than $421 million, are expected to end in November 2018. “Although the advising effort at the MOD and the MOI is one of DOD’s primary missions in Afghanistan, SIGAR found that DOD has not fully evaluated these efforts, and does not know whether the advisors assigned to MOD and MOI are meeting goals and milestones because it has not assessed, monitored or evaluated the advising efforts as required by its own guidance,” SIGAR stated in its audit aimed at evaluating how the Pentagon tracks and trains its advisers, and evaluates its own advising mission. To put it bluntly: SIGAR’s audit concluded that the Pentagon can’t really evaluate its own advising mission in part because the goalposts keep moving. For example, after analyzing the plan of action and milestones (POAM) goals — “intermediate goals and tasks that the advisors teach to” — SIGAR found that in 2015 96 percent of the Afghan MOD’s POAM goals changed and 86 percent of the Afghan MOI’s POAM goals changed. In 2016, a lower percentage of the goals changed: 28 percent of the MOD’s POAM goals and 58 percent of the MOI POAM goals. Under the system used in 2015-2016, each POAM was assigned a percentage-based score to measure how close each POAM was to completion. 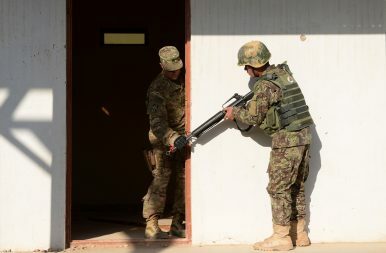 In the fall of 2017, however, the system switched to a simple “yes” or “no” assessment on individual tasks, another change to how the U.S. military and its allies in the war in Afghanistan evaluate their progress toward a stated major goal. In late summer 2017, the Trump administration unveiled its own strategy for Afghanistan, formally the U.S. strategy for South Asia. The administration claims the strategy “breathed new life into the Afghan National Defense and Security Forces (ANDSF) and the Afghan government,” as stated in a June 2018 Pentagon report to Congress. SIGAR’s audit further found that the Pentagon’s contracts with DynCorp International for the provision of advisers “do not include measurable performance standards.” Another finding noted that the Pentagon doesn’t adequately track personnel reassignments in Afghanistan. Essentially, if an adviser position is empty commanders can reassign personnel to fill the gaps, but those reassignments aren’t tracked. “This may lead to [the Department of Defense] requesting personnel with the wrong type of experience or requesting insufficient numbers of personnel for advising positions in Afghanistan,” SIGAR notes. On a related note, SIGAR also found that the Department of Defense “does not ensure that uniformed advisors take advisor training before deployment,” despite a requirement to do so. The Pentagon concurred with SIGAR’s recommendations: that the Pentagon follow its own policies, incorporate specific metrics into advising contracts, track personnel, and train advisers before deploying them. But if there’s one thing that’s certain it’s that the more things change, the more they stay the same. Trump promised a conditions-based approach to Afghanistan. Now the U.S. military is withholding data about the conditions. Fashion Faux Pas: US Wasted Millions on Afghan Army UniformsTo Tackle Corruption in Afghanistan, Fix ProcurementWhat Trump Needs to Know About AfghanistanKeeping the Faith: Afghan Women Need Continued International SupportWill the World Keep Funding Afghanistan?